This is just a quick message to say that Moving For Life (MFL) believes that the process of dealing with health difficulties is on the continuum of working for equity for all. As we each seek balance and equilibrium, MFL helps people harness their own creativity and joy to recuperate from the challenges of life. Nevertheless we come across bumps in the road – the cost of things, the access to what we need or want, the extra burdensome bits of bureaucracy and yes, still the injustices. There continue to be disparities in health services – in insurance, in health care delivery, and in health education. Moving For Life is an allied medical service – a wellness model – focusing on healthy lifestyles with expertise in movement, exercise and dance as well as in mindfulness, meditation and rejuvenation. We also are committed to partnering with groups like Cook For Your Life that teach about healthy eating and guide us to better nutrition. We are also committed to overcoming disparities in health care delivery. 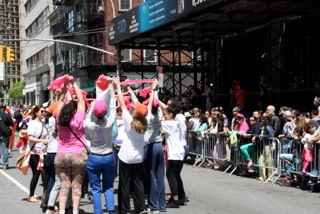 It is an uncomfortable fact that fewer African-American women in the GREATER NYC area experience breast cancer but MORE die from it. For Latina women – there is a large percentage of women that just never get the services that others have access too. 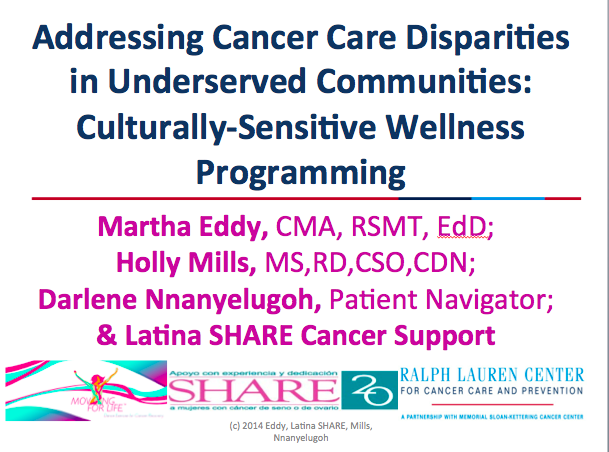 In 2014 a team including Holly Mills nutritionist, Darlene Nnanyelugoh and MFL director, Martha Eddy were accepted to present Moving For Life’s model at the Columbia University, Teacher’s College Health Disparities conference. Dr. Eddy also presented a case study from Latina SHARE. We invite you join us in this drive to bring knowledge and active guidance in safely changing habits to life-enhancing behaviors to ALL. We appreciate your spreading the word about Moving For Life programs, and our need for tax-deductible funds as well as volunteers for events and office administration. 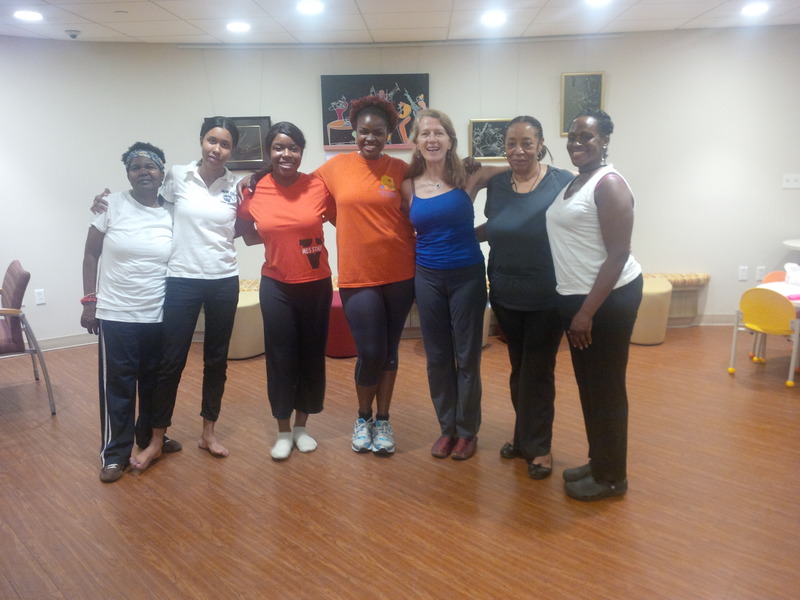 We have been honored to share Moving For Life DanceExercise for BREAST CANCER and REPRODUCTIVE CANCER RECOVERY through our partnerships with the Comprehensive Breast Center and SHARE, for CANCER RECOVERY for Women and Men (at Gilda’s Club, Queens Cancer Center, Jacobi Hospital in the Bronx), and MFL DanceExercise for Health with all people looking to improve their health at Emblem Health Neighborhood Center in Harlem. 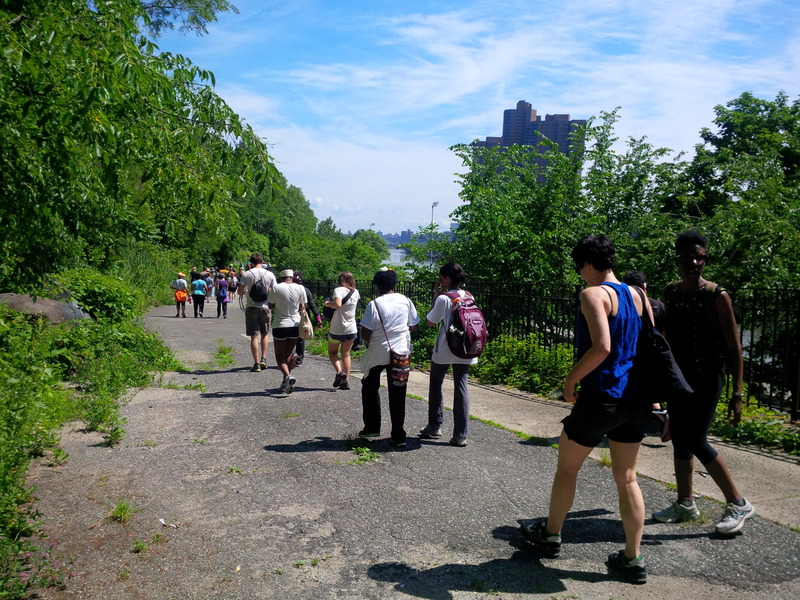 With our new status as a tax-exempt non-profit we are growing quickly to share these programs in more sites throughout the boroughs! Wishing you a day of envisioning and healthy action. We’re celebrating 2014 – and wishing you a healthy, happy and fruitful 2015! Click on the link to learn more about our year. We are delighted to celebrate with you! Posted on December 26, 2014 December 27, 2014 Categories UncategorizedTags cancer and dance, Cancer patients, dance education, Dance Parade, DanceExercise, EmblemHealth, Martha Eddy, Moving For LifeLeave a comment on We’re celebrating 2014 – and wishing you a healthy, happy and fruitful 2015! EXERCISE IS A TICKET TO LONGER LIFE: ARE YOU EXERCISING ENOUGH? This research is a bit disheartening. Only 35% of cancer patients are engaged in needed levels of exercise and many have decreased their activity since treatment. MAYBE ITS JUST NOT FUN ENOUGH. Moving For Life is fun, and full of great sensitive non-judgmental people. If you or people you know have experienced cancer its time to join our free classes or get our #DanceToRecoveryDVD. Move into Positive Health! 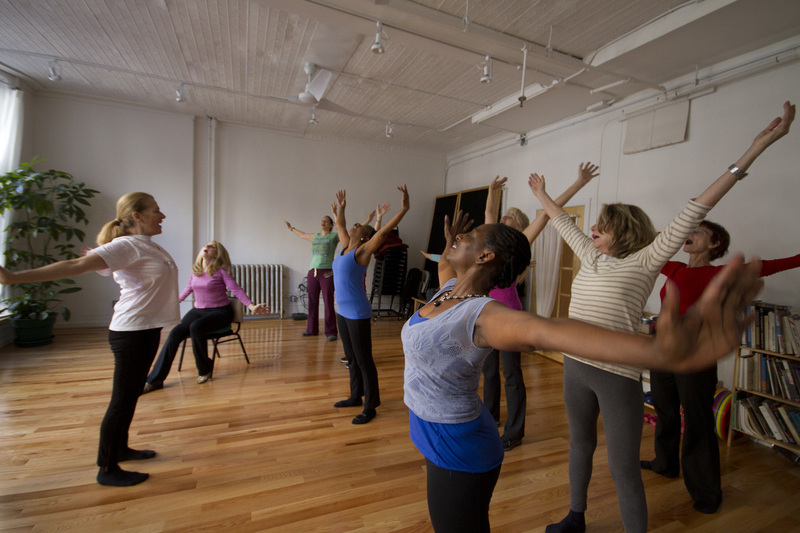 Our class at EmblemHealth, 4 doors east of the Apollo Theatre in Harlem has room for you and your loved ones. Indeed its open to anyone dealing with the stress of disease – whether high blood pressure, diabetes, weight management, or cancer. Its time to add a good helping of WELLNESS in your life. Posted on June 11, 2014 Categories Cancer Recovery, Conscious Fitness, Exercise, Get InvolvedTags cancer, Cancer patients, DanceToRecovery DVD, diabetes, disease, EmblemHealth, exercise, high blood pressure, Moving For Life, weight management, WELLNESSLeave a comment on EXERCISE IS A TICKET TO LONGER LIFE: ARE YOU EXERCISING ENOUGH?